Water Ins. : Adequate water to keep from drying out and remaining dry. 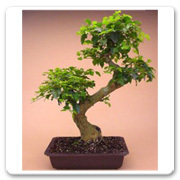 Description: The Ligustrum is another hardy tree imported from China. 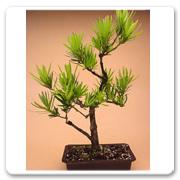 It grows well indoors and out and makes a great starter tree. It produces a small white flower and can develop attractive air roots over time. Light Conditions: Five hours of sunlight in the morning during the winter is ideal and in the summer they can have filtered sun or shade. Description: Has a wonderful pink flower with a bright red cherry. Light Conditions: Likes direct sunlight. Water Ins. : Likes slightly moist soil, but be sure to provide adequate drainage. Gray needles are a sign of overwatering. Description: This dense evergreen has pointed dark green leaves. Its symmetrical branches make this tree a classic bonsai. Water Ins. : Keep evenly moist. It generally needs lots of water during warm weather. 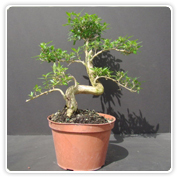 Description: Also called “Thousand Star” because of the multitude of small white flowers that this tree produces, it makes a great bonsai. The heavy trunks and interesting surface roots give this tree the sought after aged look. Light Conditions: Full morning sun, shade in the afternoon to evening. Water Ins. : Enjoys slightly moist soil, but will wilt and die if allowed to dry out completely. 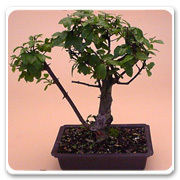 Description: This tropical beauty is one of the most popular of the indoor tropical bonsai. 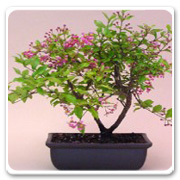 Imported from southern China it has very small leaves and produces a pinkish or whitish flower.